FELISSIMO has started selling new collaborative sundries with “Rilakkuma” on the Internet from the 14th of December. Various goods will be sold such as a full-sized futon (Japanese style-bedding) a case, a knapsack inner pocket, a tote bag, fashion items and foods. They are also releasing the a digital catalog which introduces these new collaborative items and normal items. 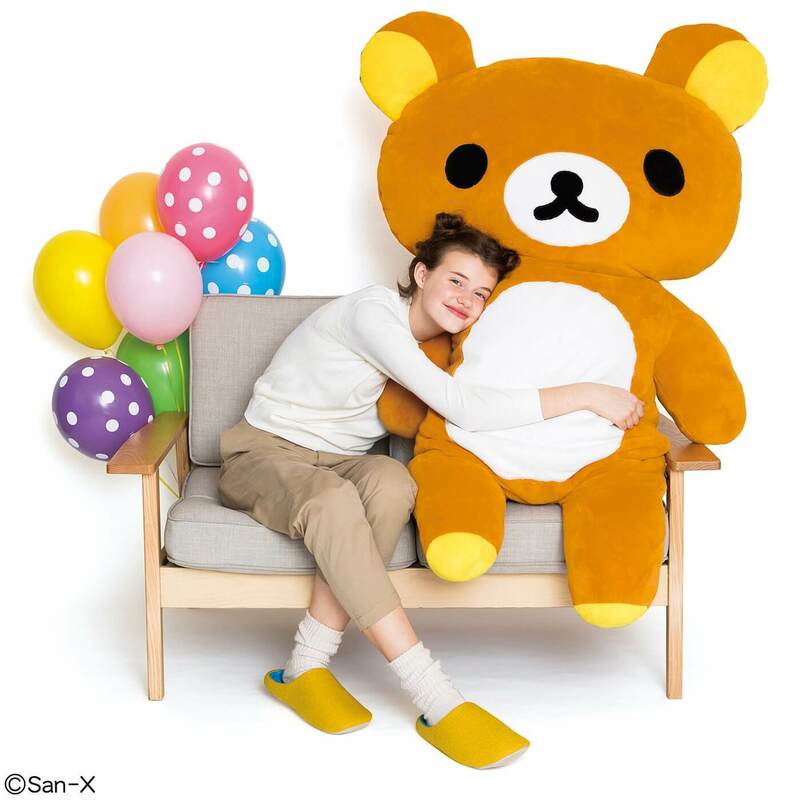 This full-size Rilakkuma is a futon case. The case will also become a stuffed toy by putting cushions that you are not using inside. Why not take a nap or watch TV with this cute housemate which can be used as a case or stuffed toy. This is a “cash register knapsack” which you can put in your shopping basket when you are checking out at the cash register. The product can be shouldered or put around one’s shoulder. 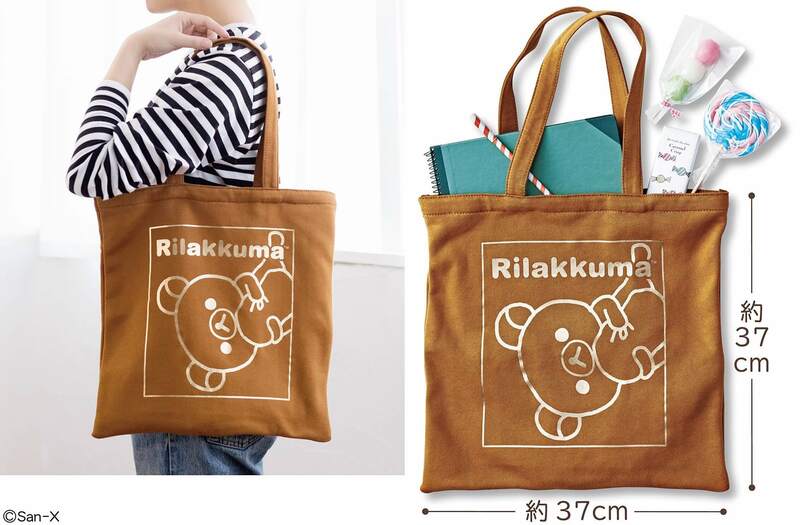 The design of Rilakkuma printed on the huge bag is very cute. You can also use it like a hammock when cleaning up inside your car. This is an inner pocket which you can put inside your knapsack which enables you to store many things in a tidy manner. Your stuff will not become jumbled together by using this product. The stiches of Korilakkuma and Kiiroi Tori are so cute. It is recommended for those of you who want to organize the inside of their knapsack. A cute wrinkled totebag made with soft cloth. 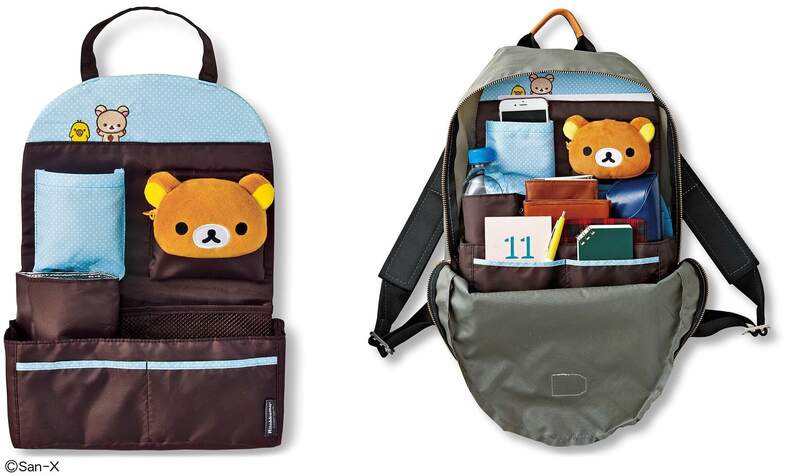 It is a moderate-sized, convenient totebag where a A4-sized notebooks of Rirakkuma laying on the floor and sketch books can be put inside. Since the color of the product is brown and it is designed simply, the product is recommended for adults, not just kids. 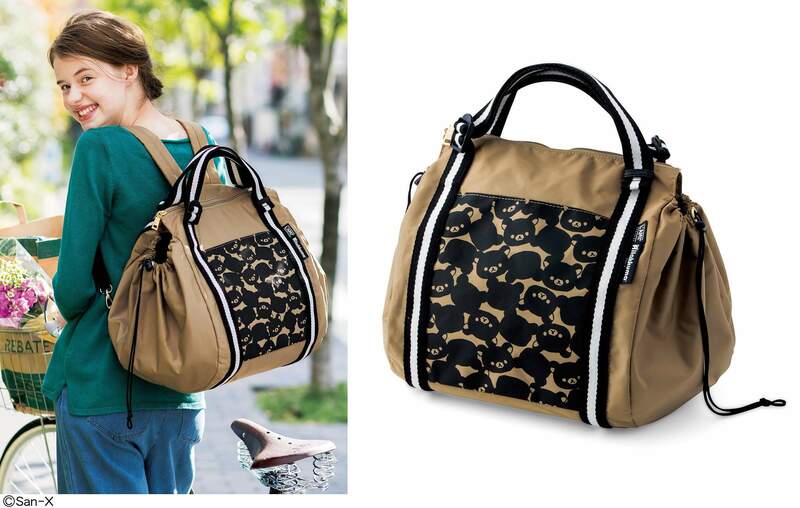 The handle of the bag can be put around your shoulder. 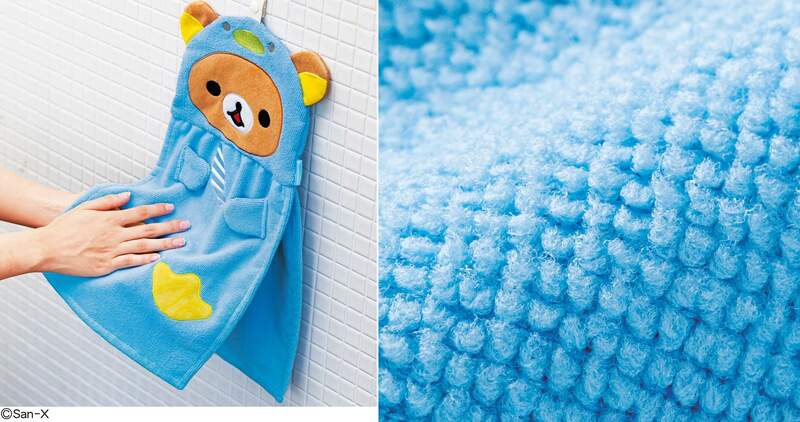 In this product Rilakkuma is turned into a popular character of the waterfront by appearing on a cute towel! The body of the towel where you can dry your hands is made with microfiber so that water on your hands can be dried quickly. 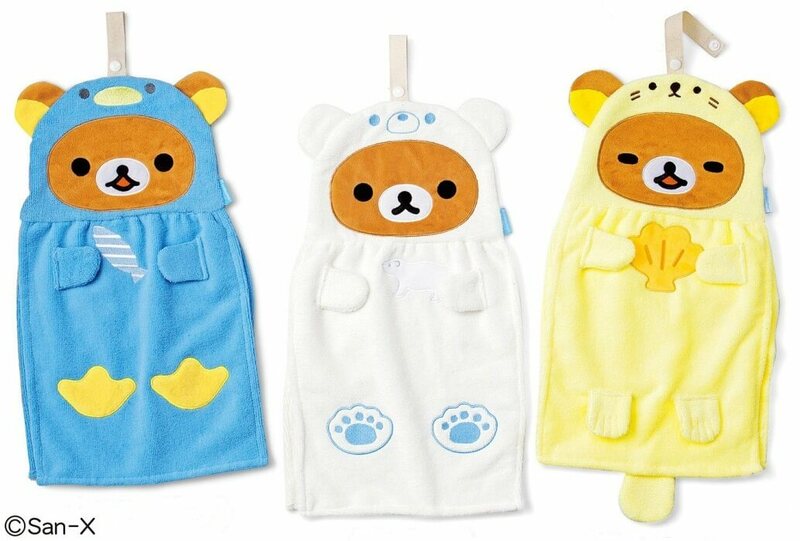 Three designs are available; “Penguin,” “Shirokuma” and “Rakko (sea otter).” You can tell your kids to stroke the illustration depicted on the towel so as to dry their hands. The towel can be hanged up since it has snap buttons and can be washed in a washing machine. This is a spread that uses lots of honey and fruit juice which Chairoi Koguma, a bear cub which has the scent of honey on its body, loves. The spread does not use any sugar which means that you can enjoy the natural sweetness and flavor of honey. Why not enjoy a tea time with this spread and pancakes? Why not get your very own relaxing and cute collaborative goods.